This plant is descended from a imported Californian BB Skunk and a male Brasil. You will love his Huge buds and the real Brasilian taste. K.C. 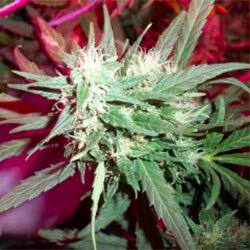 Brain’s Cristal Paradise® marijuana seeds produce tall leafy indica. Give it 8 to 11 weeks and it will thank you with great buds that bend the trunks by their own weight. Yield of 400gr/m2 per plant indoor and 600 to 800gr/per plant outdoor is average. Many experienced Cannabis farmers have confirmed that Cristal Paradise® seeds are extremely mould & plague resistent as she’s got genes to adopt to nearly any condition as long as it’s warm. If grown outdoors, she can stretch as high as 2.5m, whilst indoor variety will remain their manageable size of about 140cm. maximum. Long narrow light green leaves make a beautiful thick crone, plants will start spreading orange sweet and slightly hashish smell once the first flowers come to life. A taste of Brazil!